STEAM TURBINE INSTALLATIONS HAVE DOMINATED LNG CARRIER PROPULSION AND ELECTRIC POWER GENERATION FOR THE PAST FORTY YEARS. THE EASE WITH WHICH THESE INSTALLATIONS CAN UTILIZE BOIL-OFF GAS AND THEIR APPARENT RELIABILITY HAVE KEPT THEM IN A POSITION THAT HAS LONG BEEN LOST TO DIESEL ENGINES IN ALL OTHER SEGMENTS OF THE SHIPPING INDUSTRY. STEAM TURBINE INSTALLATIONS ARE HOWEVER NOT VERY EFFICIENT. THIS HAS A NEGATIVE IMPACT ON BOTH THE SHIP’S OPERATING ECONOMY AND ITS EXHAUST GAS EMISSIONS. EXACTLY THESE ISSUES PLAY AN INCREASINGLY IMPORTANT ROLE IN LNG SHIPPING TODAY. ENCOURAGED BY THE LATEST DEVELOPMENTS IN ITS GAS ENGINE TECHNOLOGY, WÄRTSILÄ STARTED LOOKING FOR A MORE ECONOMIC AND ENVIRONMENTALLY FRIENDLY WAY TO POWER LNG CARRIERS. MACHINERY ALTERNATIVES WITH TWO- AND FOUR-STROKE DIESEL, HIGH PRESSURE GAS-DIESEL AND LOW-PRESSURE DUAL-FUEL ENGINES, IN MECHANICAL AND ELECTRIC PROPULSION ARRANGEMENTS, WITH AND WITHOUT BOIL-OFF RE-LIQUEFACTION WERE STUDIED. DUAL-FUEL-ELECTRIC INSTALLATIONS WERE FOUND TO BE THE MOST ATTRACTIVE ALTERNATIVE TO STEAM TURBINE INSTALLATIONS. AFTER HAVING BEEN PREDOMINANTLY FLARED OFF OR RE-INJECTED FOR DECADES, NATURAL GAS IS PLAYING AN INCREASINGLY IMPORTANT ROLE IN GLOBAL ENERGY CONSUMPTION TODAY. CLEAN COMBUSTION PROPERTIES AND ABUNDANT RESERVES ARE THE MAIN BENEFACTORS FOR THIS EVOLUTION FROM UNSOLICITED BY-PRODUCT OF OIL PRODUCTION TO PREFERRED ENERGY SOURCE. WITH NATURAL GAS RESERVES OFTEN LOCATED FAR AWAY FROM ENERGY CONSUMERS AND PIPELINES EXPENSIVE OR IMPRACTICAL TO BUILD, SEABORNE TRANSPORTATION OF NATURAL GAS IS ON THE RISE AS WELL. THE MOST ECONOMIC AND COMMON WAY TO TRANSPORT NATURAL GAS BY SEA IS IN LIQUEFIED FORM. LIQUEFIED NATURAL GAS (LNG) IS TODAY TRANSPORTED BY A FLEET OF SOME TWO-HUNDRED DEDICATED LNG CARRIERS. WITH SEABORNE TRANSPORTATION OF LNG EXPECTED TO DOUBLE WITHIN THIS DECADE, A VAST EXPANSION OF THE LNG CARRIER FLEET IS IMMINENT. AT THE SAME TIME, INCREASING CARGO VOLUMES OFFER THE POSSIBILITY TO APPLY ECONOMIES OF SCALE, AND SHIPS ARE ABOUT TO SIGNIFICANTLY GROW IN SIZE. THESE CIRCUMSTANCES CREATE THE NEED TO VERIFY THE TECHNICAL SOLUTIONS THAT HAVE BEEN APPLIED IN LNG CARRIERS SO FAR. FOR THE PAST FORTY YEARS, STEAM TURBINE INSTALLATIONS HAVE DOMINATED ONBOARD LNG CARRIERS. THE EASE WITH WHICH STEAM TURBINE INSTALLATIONS CAN BURN BOIL-OFF GAS AND THEIR APPARENT RELIABILITY HAVE KEPT THEM IN THE CONTROLLING POSITION THAT HAS BEEN TAKEN OVER BY DIESEL ENGINE INSTALLATIONS A LONG TIME AGO IN ALL OTHER SEGMENTS OF THE SHIPPING INDUSTRY. 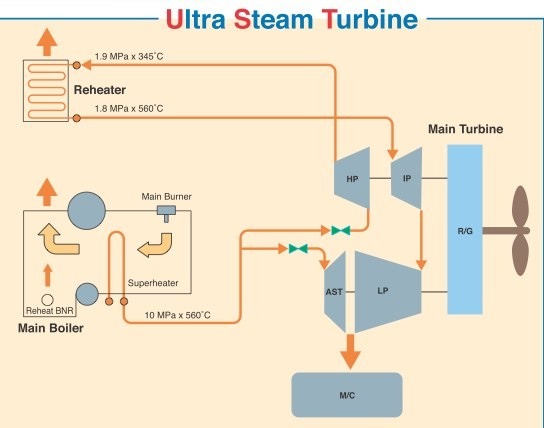 A TYPICAL STEAM TURBINE INSTALLATION CONSISTS OF TWO BOILERS, MOST COMMONLY FIRED WITH BOIL-OFF GAS AND HEAVY FUEL OIL (HFO). A STEAM TURBINE IS DRIVING A FIXED-PITCH PROPELLER THROUGH A HIGH-SPEED GEARBOX. TWO ADDITIONAL STEAM TURBINES AND ONE OR TWO DIESEL ENGINES ARE DRIVING ALTERNATORS TO GENERATE ELECTRIC POWER. STEAM TURBINE INSTALLATIONS ARE HOWEVER NOT VERY EFFICIENT. THIS HAS A NEGATIVE IMPACT ON THE OPERATING ECONOMY AND EXHAUST GAS EMISSIONS OF THE SHIP. EXACTLY THESE ISSUES PLAY AN INCREASINGLY IMPORTANT ROLE IN LNG SHIPPING THESE DAYS. AN ATTRACTIVE ALTERNATIVE SHOULD BE OUTPERFORMING THE STEAM TURBINE INSTALLATION WITH RESPECT TO ITS APPARENT DISADVANTAGES, WHILE AT THE SAME TIME AT LEAST MATCHING IT WITH RESPECT TO ITS ADVANTAGES. IT IS THEREFORE IMPORTANT TO STUDY THESE ADVANTAGES AND DISADVANTAGES. THE MAIN REASON TO REMAIN FAITHFUL TO THE STEAM TURBINE INSTALLATION IN LNG CARRIERS IS THE EASE WITH WHICH THEY CAN BURN BOIL-OFF GAS. BOIL-OFF GAS IS AN UNAVOIDABLE BY-PRODUCT OF THE SEABORNE LNG TRANSPORTATION CONCEPT. A SMALL AMOUNT OF CARGO, APPROXIMATELY 0.13% PER DAY IN LADEN CONDITION, IS LEFT TO EVAPORATE IN ORDER TO CONTROL TEMPERATURE AND PRESSURE IN THE SHIP’S CARGO TANKS. BOTH QUANTITY AND QUALITY OF THE BOIL-OFF GAS ARE SUBJECT TO VARIATION. ALTHOUGH STEAM TURBINE INSTALLATIONS CAN UTILIZE BOIL-OFF GAS VERY EASILY, THEY DO NOT USE IT VERY EFFICIENTLY. LOSSES IN THE BOILERS, STEAM TURBINE, HIGH-SPEED REDUCTION GEAR AND SHAFTING BRING THE EFFICIENCY OF THE PROPULSION MACHINERY TO A LEVEL BELOW 29% AT FULL LOAD. THE EFFICIENCY OF THE ELECTRIC POWER GENERATION MACHINERY IS BELOW 25% AT FULL LOAD. PART-LOAD EFFICIENCIES OF BOTH THE PROPULSION AND ELECTRIC POWER GENERATION MACHINERY ARE EVEN LOWER. SUCH LOW MACHINERY EFFICIENCIES LEAD TO A SUBSTANTIAL AMOUNT OF HFO BEING REQUIRED FOR COMPLEMENTING THE AVAILABLE BOIL-OFF GAS. IN LADEN CONDITIONS, SOME 50% OF THE SHIP’S ENERGY REQUIREMENT IS COVERED WITH HFO. IN BALLAST CONDITION, THIS SHARE GROWS TO 80%. ALSO FOR LNG CARRIERS, LIKE FOR ANY OTHER KIND OF SHIP, FUEL COSTS ARE ONE OF THE MOST IMPORTANT COMPONENTS OF THE SHIP’S OPERATING COSTS. THE LOW EFFICIENCY AND THE NEED TO USE LARGE AMOUNTS OF HFO HAVE A NEGATIVE IMPACT ON THE SHIP’S CO2 AND SOX EMISSIONS. CO2 EMISSIONS ARE ALREADY THE FOCUS OF ATTENTION THESE DAYS, AND CAN BE EXPECTED TO GET EVEN MORE ATTENTION IN THE NEAR FUTURE. GAS TANKERS ATTRACT LOTS OF ATTENTION FROM SAFETY REGULATORS WORLDWIDE. THE SAFETY OF CREW, SHIP AND ENVIRONMENT IS OF UTMOST IMPORTANCE. ONBOARD LNG CARRIERS, STEAM TURBINE INSTALLATIONS HAVE A VERY DECENT SAFETY RECORD. NO MAJOR CALAMITIES HAVE BEEN REPORTED. DUE TO THE NATURE OF THE LNG TRADE, IT IS ALSO IMPORTANT THAT MAINTENANCE OF THE MACHINERY INSTALLATION DOES NOT INTERFERE WITH THE SAILING SCHEDULE OF THE SHIP OR INFLUENCE ITS PERFORMANCE. STEAM TURBINE INSTALLATIONS REQUIRE A MODEST AMOUNT OF WELL-SCHEDULABLE MAINTENANCE. THE TIMING CAN EASILY BE MADE TO COINCIDE WITH THE WET- AND DRY-DOCKING INTERVALS OF THE SHIP. ALTERNATIVE MACHINERY INSTALLATIONS FOR LNG CARRIERS COULD POTENTIALLY BE BUILT AROUND DIESEL ENGINES, GAS-DIESEL ENGINE, DUAL-FUEL ENGINES AND GAS TURBINES. SINCE THE NINETEEN-SEVENTIES, DIESEL ENGINE INSTALLATIONS HAVE BECOME DOMINANT IN ALL SHIPPING SEGMENTS, EXCEPT LNG SHIPPING. EXPERIENCE GAINED FROM THOUSANDS OF DIESEL ENGINE INSTALLATIONS IN SERVICE HAS RESULTED IN THE DEVELOPMENT OF HIGHLY-EFFICIENT, RELIABLE AND SAFE DIESEL ENGINES. THE LATEST DEVELOPMENTS, LIKE THE APPLICATION OF COMMON RAIL FUEL INJECTION ON BOTH FOUR- AND TWO-STROKE DIESEL ENGINES, ARE TAKING DIESEL ENGINE TECHNOLOGY YET ONE STEP FURTHER. ONLY BEEN APPLIED IN THE MARINE ENVIRONMENT ON A VERY LIMITED SCALE. DRIVE TO A FIXED-PITCH PROPELLER. IN ORDER TO KEEP THE COMPLEXITY LOW AND THE OPERATIONAL FLEXIBILITY HIGH, ELECTRIC POWER WILL LIKELY BE GENERATED BY A GROUP OF FOUR-STROKE DIESEL GENERATING SETS. DEVICES FOR LOCKING OR DISCONNECTING THE PROPELLER SHAFTS WILL BE NECESSARY TO ENABLE MAINTENANCE ACTIVITIES ON ONE ENGINE WHILE SAILING.HAVING ONE ENGINE OUT OF OPERATION FOR MAINTENANCE WILL HOWEVER STILL HAVE A SUBSTANTIAL IMPACT ON THE SHIP’S SERVICE SPEED. THIS IMPACT CAN BE REDUCED BY SELECTING CONTROLLABLE-PITCH PROPELLERS, OR BY USING THE TUNING POSSIBILITIES OF ELECTRONICALLY-CONTROLLED, COMMON RAIL TWO-STROKE ENGINES. THE EXHAUST EMISSIONS OF TWO-STROKE ENGINE INSTALLATIONS ARE REASONABLE, BUT CERTAINLY NOT EXCELLENT.WITHOUT ADDITIONAL EQUIPMENT LIKE SCR UNITS OR DIRECT WATER INJECTION, NOX EMISSIONS ARE SUBSTANTIAL. AS AN INEVITABLE CONSEQUENCE OF USING HFO AS A FUEL, SOX EMISSIONS ARE HIGH TOO. MORE PROPULSION REDUNDANCY AND OPERATIONAL FLEXIBILITY CAN BE OFFERED BY APPLYING MULTIPLE FOUR-STROKE DIESEL ENGINES DRIVING CONTROLLABLE-PITCH PROPELLERS THROUGH REDUCTION GEARS. A FURTHER ENHANCEMENT CAN BE REALIZED BY APPLYING ELECTRIC PROPULSION. THE APPLICATION OF ELECTRIC PROPULSION WILL AT THE SAME TIME RESULT IN A HIGHER PART-LOAD EFFICIENCY. 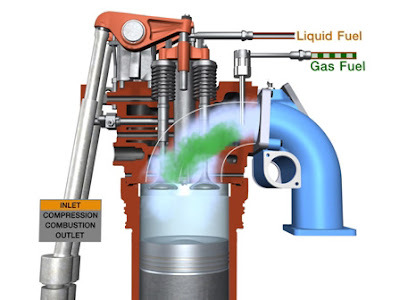 GAS-DIESEL ENGINES ACT ACCORDING TO THE DIESEL PRINCIPLE AND CAN VIRTUALLY BURN ANY POSSIBLE MIXTURE OF GAS AND LIQUID FUEL, WITH ONLY A FEW RESTRICTIONS TO THE QUALITY OF THE GAS. AS THE MIXTURE OF GAS AND LIQUID FUEL IS INJECTED INTO THE COMBUSTION CHAMBER DURING AIR COMPRESSION, THE REQUIRED INJECTION PRESSURE IS HIGH. FOR FOUR-STROKE GAS-DIESEL ENGINES, A GAS PRESSURE OF AROUND 350 BAR IS REQUIRED, WHILE FOR TWO-STROKE GAS-DIESEL ENGINES SOME 250 BAR IS DEEMED SUFFICIENT. WÄRTSILÄ BROUGHT ITS FIRST FOUR-STROKE GAS-DIESEL ENGINE, THE WÄRTSILÄ 32GD, WITH AN OUTPUT OF 410 KILOWATT PER CYLINDER, TO THE MARKET IN 1987. THE LARGER WÄRTSILÄ 46GD, WITH AN OUTPUT OF 975 KILOWATT PER CYLINDER, WAS INTRODUCED IN 1991. EXCEPT FOR THE RELIQUEFACTION PLANT, LNG MACHINERY INSTALLATIONS BASED ON GAS-DIESEL ENGINES LOOK FAIRLY SIMILAR TO CONCEPTS BASED ON CONVENTIONAL DIESEL ENGINES. AS BOIL-OFF GAS IS GENERATED AT ATMOSPHERIC PRESSURE, LARGE GAS COMPRESSORS ARE REQUIRED TO BOOST THE GAS PRESSURE TO THE APPROPRIATE LEVEL. THESE COMPRESSORS REQUIRE A SUBSTANTIAL AMOUNT OF ELECTRIC POWER TO OPERATE AND ARE COSTLY AND HEAVY. ADDITIONALLY, THE PRESENCE OF HIGH-PRESSURE GAS IN THE ENGINE ROOM IS A MAJOR SAFETY CONCERN, ESPECIALLY ON LNG CARRIERS. EMISSIONS OF GAS-DIESEL ENGINE INSTALLATIONS ARE GENERALLY LOWER THAN THOSE OF STEAM TURBINE AND DIESEL ENGINE INSTALLATIONS AS A RESULT OF HIGHER EFFICIENCY AND CLEANER FUEL, RESPECTIVELY. DEAD-CENTRE A VERY SMALL AMOUNT OF MDO IS INJECTED IN ORDER TO TRIGGER IGNITION. PROVIDED THAT AN ADEQUATE GAS SUPPLY SYSTEM IS INSTALLED, DUAL-FUEL ENGINES CAN ACCEPT ALL GAS QUALITIES SEEN IN LNG SHIPPING. IN ADDITION TO RUNNING ON GAS, DUAL-FUEL ENGINES CAN RUN ON MDO. WHEN RUNNING ON MDO, THE DUAL-FUEL ENGINE ACTS AS A NORMAL DIESEL ENGINE. IN CASE THE SUPPLY OF GAS IS INTERRUPTED, THE DUAL-FUEL ENGINE AUTOMATICALLY TRANSFERS TO DIESEL MODE, WITHOUT LOSS OF ENGINE POWER OR SPEED. THE TRANSFER FROM DIESEL TO GAS MODE IS CARRIED OUT FULLY-AUTOMATIC ON DEMAND. LOW-PRESSURE DUAL-FUEL TECHNOLOGY IS ONLY AVAILABLE ON FOUR-STROKE ENGINES. THE FIRST WÄRTSILÄ DUAL-FUEL ENGINE, THE WÄRTSILÄ 32DF, WAS BROUGHT TO THE MARKET IN 1996. THIS ENGINE, WITH A POWER OF UP TO 350 KILOWATT PER CYLINDER, IS AVAILABLE IN SIX- AND NINE-CYLINDER INLINE AND TWELVE- AND EIGHTEEN-CYLINDER VEE-FORM CONFIGURATIONS. AS A RESULT OF HIGHER EFFICIENCY AND CLEANER FUEL,EMISSIONS OF DUAL-FUEL INSTALLATIONS ARE LOWER THAN THOSE OF STEAM TURBINE, DIESEL AND GAS-DIESEL INSTALLATIONS. IN COMBINATION WITH AN ELECTRIC PROPULSION SYSTEM, DUAL- FUEL INSTALLATIONS ACHIEVE OPTIMUM PERFORMANCE AND HIGH EFFICIENCY AT VIRTUALLY ANY LOAD. GAS TURBINE INSTALLATIONS COULD ALSO POTENTIALLY BE APPLIED IN LNG CARRIERS. THEIR RATHER LOW EFFICIENCY AT PART-LOAD, DIFFICULTY IN COPING WITH HIGH AMBIENT TEMPERATURES, NEED FOR HIGH GAS PRESSURE AND THE REQUIRED SPECIAL SKILLS AND PROCEDURES FOR MAINTENANCE, MAKE THEM LESS ATTRACTIVE. THE FEASIBILITY OF GAS-DIESEL ENGINES FOR PROPULSION AND ELECTRIC POWER GENERATION ONBOARD LNG CARRIERS WAS STUDIED BY WÄRTSILÄ AND OTHERS SOME TEN YEARS AGO. THE NEED FOR GAS COMPRESSION TURNED OUT TO BE A TOO HIGH BURDEN FOR THE OPERATING ECONOMY OF THE SHIP. THE QUANTIFIABLE CHARACTERISTICS OF THE OTHER ALTERNATIVES WERE COMPARED USING A SPECIALLY DEVELOPED COMPARISON TOOL, WHEREAS THEIR NON-QUANTIFIABLE CHARACTERISTICS WERE DISCUSSED AND COMPARED TOGETHER WITH MAJOR LNG CARRIER OWNERS, OPERATORS, MANAGERS AND SHIPYARDS OVER THE PAST FEW YEARS. WHEN COMPARING THE OPERATIONAL ECONOMY OF THE VARIOUS ALTERNATIVES, IT IS IMPORTANT TO TAKE THE WHOLE MACHINERY INSTALLATION INTO ACCOUNT. TWO-STROKE DIESEL ENGINES HAVE A HIGH EFFICIENCY, BUT THE NEED TO RELIQUEFY THE BOIL-OFF GAS GIVES INSTALLATIONS FEATURING THIS TYPE OF ENGINES A HIGHER TOTAL ENERGY CONSUMPTION. THE MOST ATTRACTIVE ALTERNATIVE TO THE TRADITIONAL STEAM TURBINE INSTALLATION TURNED OUT TO BE DUAL-FUEL-ELECTRIC MACHINERY. AS A RUNNER UP BUT AT CLEAR DISTANCE TO DUAL-FUEL-ELECTRIC MACHINERY, AN INSTALLATION FEATURING TWIN TWO-STROKE ENGINES, EACH IN DIRECT-DRIVE TO A FIXED-PITCH PROPELLER, A RELIQUEFACTION PLANT, AND A GROUP OF FOUR-STROKE DIESEL GENERATING SETS EMERGED. CENTRAL IN THE DUAL-FUEL-ELECTRIC PROPULSION AND ELECTRIC POWER GENERATION SOLUTION ARE MULTIPLE DUAL-FUEL GENERATING SETS. THE NUMBER AND SIZE OF THESE SETS OF COURSE LARGELY DEPENDS ON THE SHIP SIZE AND SPEED, BUT ALSO ON THE ENVISAGED OPERATING PHILOSOPHY. AN LNG CARRIER WITH A CARGO CAPACITY OF SOME 150’000M3 WILL TYPICALLY REQUIRE ONE SIX- AND THREE TWELVE-CYLINDER WÄRTSILÄ 50DF ENGINES. AN LNG CARRIER WITH A CARGO CAPACITY OF 200’000 M3 WILL TYPICALLY REQUIRE TWO SIX- AND FOUR NINE-CYLINDER ENGINES, AND A SHIP OF 250’000 M3 CARGO CAPACITY WILL DO WITH TWO SIX- AND FOUR TWELVE-CYLINDER WÄRTSILÄ 50DF DUAL-FUEL ENGINES. THE GENERATED ELECTRIC POWER IS FED TO AN ELECTRIC DRIVE FAIRLY SIMILAR TO THOSE USED ON CONTEMPORARY CRUISE SHIPS. TWO ‘HIGH-SPEED’ ELECTRIC PROPULSION MOTORS DRIVE A FIXED-PITCH PROPELLER THROUGH A REDUCTION GEAR. TWIN ‘LOW-SPEED’ ELECTRIC MOTORS MOUNTED ON THE SAME SHAFT CAN BE SELECTED TO DRIVE THE PROPELLER WITHOUT ASSISTANCE OF A GEARBOX ALTERNATIVELY. FOR THE LARGER SHIPS, TWIN-SCREW ARRANGEMENTS CAN BE SELECTED WITHOUT SIGNIFICANTLY INCREASING THE COMPLEXITY OF THE MACHINERY INSTALLATION. MORE CARGO WEIGHT. CARRYING MORE CARGO VOLUME IS ENABLED BY THE FACT THAT THE DUAL-FUEL-ELECTRIC SOLUTION SAVES ENGINE ROOM SPACE . EVEN WHEN USING A SMALL PART OF THE CARGO AS FUEL, A DUAL-FUEL-ELECTRIC LNG CARRIER WILL DELIVER MORE CARGO TO THE UNLOADING PORT IN THIS WAY. THE EFFICIENCY OF THE PROPULSION MACHINERY OF A DUAL-FUEL-ELECTRIC LNG CARRIER IS APPROXIMATELY 41% AND THE EFFICIENCY OF THE ELECTRIC POWER GENERATION MACHINERY IS AROUND 44%, COMPARED TO 29% AND 25% RESPECTIVELY FOR A STEAM TURBINE INSTALLATION. A TWO-STROKE DIESEL ENGINE INSTALLATION WILL HAVE A PROPULSION MACHINERY EFFICIENCY OF ABOUT 48% AND THE EFFICIENCY OF THE ELECTRIC POWER GENERATION MACHINERY WILL BE ABOUT 41%, BUT WILL CONSUME A SUBSTANTIALLY HIGHER AMOUNT OF ELECTRIC POWER DUE TO THE PRESENCE OF THE LIQUEFACTION PLANT. ADDING THE CHEAPER FUEL OF THE DUAL-FUEL-ELECTRIC LNG CARRIER TO THE EQUATION, THIS SOLUTION CLEARLY EXCELS IN TERMS OF OPERATING COSTS. WHEN EXCLUSIVELY USING NATURAL AND FORCED BOIL-OFF GAS AS FUEL, THE DUAL-FUEL ELECTRIC SOLUTION SHOWS UNRIVALLED EMISSION VALUES . ALL OTHER MACHINERY ALTERNATIVES SUFFER FROM THE USE OF HFO, EITHER USED UNIQUELY OR IN COMBINATION WITH NATURAL BOIL-OFF GAS. A ‘SAFETY CONCEPT’ FOR DUAL-FUEL-ELECTRIC MACHINERY ONBOARD LNG CARRIERS HAS BEEN DEVELOPED BY WÄRTSILÄ TO MAKE SURE THAT THE SAFETY OF THE INSTALLATION COMPLIES WITH CLASS AND AT LEAST MATCHES THE SAFETY OF STEAM TURBINE INSTALLATIONS. THE RECENT INTRODUCTION OF DOUBLE-WALL GAS PIPING ON THE WÄRTSILÄ 50DF WILL FURTHER INCREASE THE SAFETY OF THE SOLUTION. WITH SEVERAL POTENTIAL CUSTOMERS AND CLASS, SAFETY STUDIES INCLUDING HAZARD IDENTIFICATION, FMEA AND HAZARDOUS OPERATIONS STUDIES, HAVE BEEN CONDUCTED TO FURTHER VALIDATE THE SAFETY OF THE SOLUTION. THE WÄRTSILÄ 50DF HAS BEEN DERIVED FROM THE WÄRTSILÄ 46, A DIESEL ENGINE THAT HAS PROVEN ITS RELIABILITY IN VARIOUS DEMANDING MARINE APPLICATIONS, SUCH AS CRUISE SHIPS. THE USE OF GAS IN THE WÄRTSILÄ 50DF AS COMPARED TO HFO IN THE WÄRTSILÄ 46 FURTHER ENHANCES THIS INHERITED RELIABILITY. CASE STUDIES FOR VARIOUS CUSTOMERS HAVE SHOWN THAT THE REQUIRED MAINTENANCE ON DUAL-FUEL-ELECTRIC INSTALLATIONS CAN EASILY BE CARRIED OUT WITHOUT AFFECTING THE SHIP’S OPERATIONAL PERFORMANCE. MAINTENANCE OF DUAL-FUEL-ELECTRIC INSTALLATIONS IS MORE COSTLY THAN OF STEAM TURBINE INSTALLATION, BUT DOES NO HARM TO THE SHIP’S OPERATING ECONOMY. DUAL-FUEL-ELECTRIC INSTALLATIONS CAN BE OPERATED AND MAINTAINED BY DIESEL ENGINE CREWS. THERE IS NO NEED FOR CREW MEMBERS WITH EXCEPTIONAL SKILLS OR EXPERIENCE. THE DUAL-FUEL-ELECTRIC INSTALLATION PROVIDES EXCELLENT PROPULSION CHARACTERISTICS FOR NAVIGATION IN ICE, DUE TO THE AVAILABILITY OF FULL PROPELLER TORQUE AT ZERO SPEED AND EXCELLENT MANOEUVRING CHARACTERISTICS. DUAL-FUEL-ELECTRIC INSTALLATIONS CAN EASILY COPE WITH THE POWER REQUIREMENTS OF DYNAMIC POSITIONING SYSTEMS. THIS MIGHT BECOME A VALUABLE FEATURE, AS AN INCREASING AMOUNT OF OFFSHORE LNG TERMINALS IS ENVISAGED.